I have owned and been fascinated by reptiles for many years. But this past October really put my skills to the test. 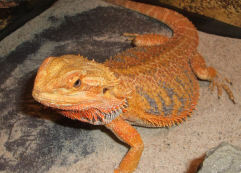 I was given 2 Bearded Dragons by a couple I met in a pet store. These Dragons where emaciated and in really bad shape. After bringing them to the vet, I had to make a difficult decision to euthanize one of them. The other Dragon is doing amazingly well – he has doubled in weight, and he has the best personality I have ever seen in a reptile. He always wants to be with someone, on their shoulder or sleeping on my computer desk. He even sleeps in my bed. He is a curious little guy and never wants to be in his tank, hence the name, “Curious George”. He can change into the most amazing colors depending on his mood. I am not sure of his age because he was given to me and the previous owners were not sure of anything. I am just so glad that I could save one from a life of misery and that he came out to be an amazingly gentle and loving animal.